Bake tenders according to package directions. Overcooking will cause the tenders to become dry. Reserve for Step 8. CCP: Heat to 165 degrees F or higher for 15 seconds at the completion of the cooking process. Wash cucumbers, tomatoes, broccoli, and cauliflower. Slice cucumber ¼ inch thick. If needed, cut broccoli and cauliflower into bite-size pieces. Wash and drain green leaf lettuce if not prewashed. Thinly slice. Combine salad greens. Fill salad tray with 2 cups of prewashed mixed greens. Note: If greens are not prewashed, rinse under cold running water and drain thoroughly. Place 3 slices of cucumber in front left corner of tray. Add broccoli florets and cauliflower florets in right corner. Place 3 cherry tomatoes or 6 grape tomatoes in front right corner. Cut 2 tenders into bite size pieces and place in center of salad. Combine shredded cheeses and sprinkle 1 ounce of cheese over chicken tenders. Place packet of salad dressing in bottom left corner. Portion 1 salad per serving. Each portion provides 2 oz. eq. meat/meat alternate, 1 oz. eq. whole grains, 5/8 cup dark green vegetable, 5/8 cup other vegetable, and ¼ cup red/orange vegetable. 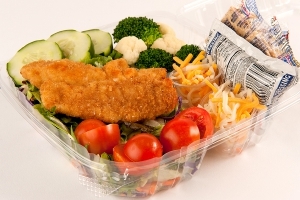 Presentation Ideas: Clear container allowing space for the salad, dressing, or other ingredients is recommended. Clear plastic lid for eye appeal is preferable. 1 serving Chicken Tenders Salad.